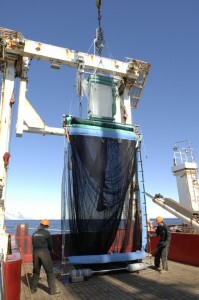 The main deliverable of the Western Core Box (WCB) is a consistent unique time series of mesoscale distribution and abundance of macro-zooplankton and micronekton, and an understanding of the physical environment they are within at South Georgia, South Atlantic (1996 – current). The focus of the survey is an on/off shelf survey box (80 * 100 km) located on the north-western shelf of South Georgia. 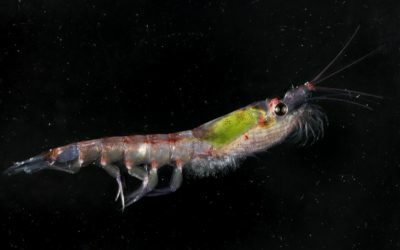 These data are required to understand the long term variability of the marine ecosystem, in particular krill biomass, at South Georgia and the influences from climate variability, fishing pressure and predation. Euphausia superba (krill) from the Bellingshausen Sea continental shelf. Euphausiid crustaceans use their thoracic appendages as a suspension feeding basket. 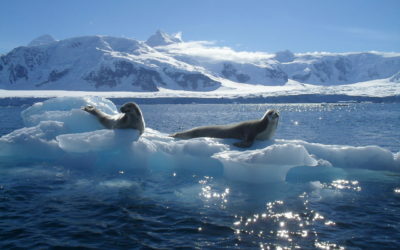 They are a very important source of prey to penguins, seals and whales and some fish. 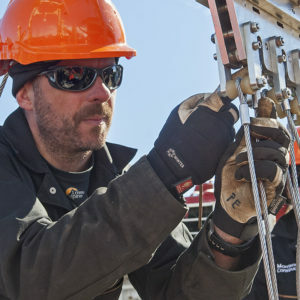 The programme receives funding through NERC’s British Antarctic Survey Long Term Monitoring Programme. 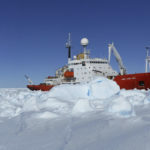 The WCB is coordinated by the Ecosystem programme as part of Polar Science for Planet Earth. It was formalised into a consistent annual survey programme in 1996 (data pre this date exist, but are variable), with an additional (reduced coverage) intra-annual programme undertaken between 2000 and 2005 (Brierley et al. 1997; Reid et al. 2010; Fielding et al. 2014). The WCB continues to contribute to science and policy development through contributions to the Commission for the Conservation of Antarctic Marine Living Resources (CCAMLR) working groups, as well as contributing directly to 42 refereed publications, to European (IMBER- Cury et al. 2011) and International (IWC) collaborations and 1 masters and 5 PhD theses. It also provides a data contribution to the UNESCO/IOC International Ocean Carbon Coordination Project (IOCCP). 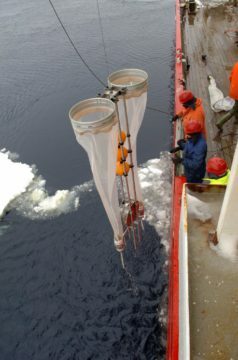 In addition the WCB has provided a platform for samples to be collected for 12 AFI and AFI-CGS projects providing collaboration and access for science around South Georgia. There is the potential to link to the WCB survey for discrete one-off cruise participation, or to consider longer term work into the future, particularly focussed around the areas of oceanography, primary production, and biogeochemistry. The WCB is intimately linked with several trophic levels of the Ecosystems programme. Publications have resulted from krill and biogeochemistry links (Whitehouse et al. 2009), organism level organisation (Tarling et al. 2009), basin scale teleconnections (Murphy et al. 2007) and higher predator/prey interactions (Reid et al. 2010). 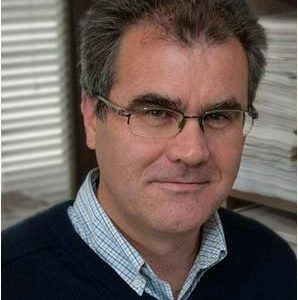 Data collected from the WCB have contributed to information for the IWC (Sirovic et al. 2005), contribute to the IOC International Ocean Carbon Coordination Project (IOCCP) (Hardman-Mountford pers comm. ), EU projects (Cury et al. 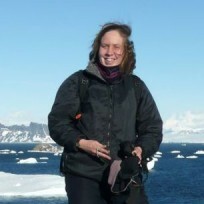 2011) as well as being a regular contribution in papers submitted for discussion in the CCAMLR working groups (e.g. Tarling et al. 2009; Reid et al. 2005; Trathan et al. 2003). 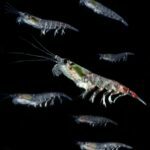 The importance of sustained observations of krill density has been highlighted recently by an EU special working group on krill and the changing climate (Flores et al. 2012). Brierley AS, Watkins JL, Murray AWA (1997) Interannual variability in krill abundance at South Georgia. Mar Ecol Prog Ser 150:87–98. Cury,P.M., Boyd,I.L., Bonhommeau, S., Anker-Nilssen, T., Crawford, R.J.M., Furness, R.W., Mills, J.A., Murphy, E.J., Ôsterblom, H., Paleczny, M., Piatt, J.F., Roux, J-P, Shannon, L. and Sydeman, W.J. (2011) Global seabird response to forage fish depletion – one-third for the birds. Science 334(6063): 1703–1706. Flores H, Atkinson A, Kawaguchi S, Krafft BA, Milinevsky G, Nicol S, Reiss C, Tarling GA, Werner R, Bravo Rebolledo E, Cirelli V, Cuzin-Roudy J, Fielding S, van Franeker JA, Groeneveld JJ, Haraldsson M, Lombana A, Marschoff E, Meyer B, Pakhomov EA, Van de Putte AP, Rombolá E, Schmidt K, Siegel V, Teschke M, Tonkes H, Toullec JY, Trathan PN, Tremblay N, Werner T (2012) Response of Antarctic krill to climate change. Marine Ecology Progress Series 458: 1-19. K Reid, JP Croxall, DR Briggs, EJ Murphy (2005) Antarctic ecosystem monitoring: quantifying the response of ecosystem indicators to variability in Antarctic krill. ICES Journal of Marine Science; 62: 366-373. Reid, K, Watkins, J, Murphy, E, Trathan, P, Fielding, S and Enderlein, P (2010) Multiple time scales of variability in the krill population at South Georgia. Marine Ecology Progress Series 399: 243-252. Tarling GA, Klevjer T, Fielding S, Watkins J, Atkinson A, Murphy E, Korb R, Whitehouse M, Leaper R (2009) Variability and predictability of Antarctic krill swarm structure. 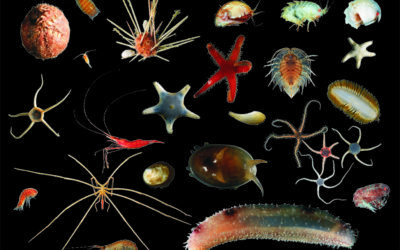 Deep-Sea Research I 56: 1994-2012. Trathan PN, AS Brierley, MA Brandon, DG Bone, C Goss, S Grant, EJ Murphy, JL Watkins (2003) Oceanographic variability and changes in Antarctic krill abundance at South Georgia. 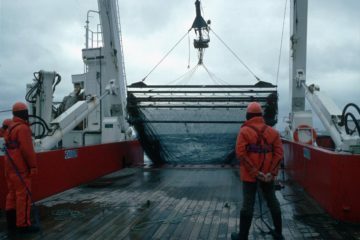 Fisheries Oceanography; 12(6):569-583. 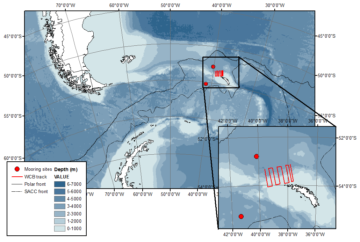 MJ Whitehouse, A Atkinson, P Ward, RE Korb, P Rothery, S Fielding (2009) Role of krill versus bottom-up factors in controlling phytoplankton biomass in the northern Antarctic waters of South Georgia. Marine Ecology Progress Series; 393: 69-82. 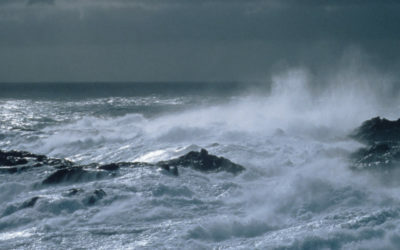 In 1996 the Western Core Box Series became a formalised programme of sustained observations of hydrography and zooplankton/micronekton to assess the status of the marine ecosystem in the region of South Georgia, Atlantic sector of the Southern Ocean. This unique time series, known as the Western Core Box (WCB) series, is a contribution to sustained observations of the ecosystem by the British Antarctic Survey. The long-term objective of the survey is to quantify the inter-annual mesoscale variability in the environment and in plankton (particularly Antarctic krill), with research focussing on links between prey distribution and availability, predation pressure and climate variability. mesoscale distribution and abundance of Antarctic krill. mesoscale distribution and abundance of other plankton/micronekton. Data are currently considered on request due to the recent revisions in krill density estimation methods. Significant effort in generating a web-based database has resulted in an online access as a realistic near future prospect dependant on suitable data distribution policies being created and implemented.